Winds from Hurricane Florence have begun whipping coastal North Carolina as the slow-moving storm began to unleash fierce rains that forecasters have warned would cause catastrophic flooding across a wide area of the US southeast. The centre of Florence is expected to hit North Carolina's southern coast on Friday and then drift southwest before moving inland on Saturday, enough time to drop as much as 40 inches of rain in places, according to the National Hurricane Center. More than one million people had been ordered to evacuate the coasts of the Carolinas and Virginia and thousands moved to emergency shelters, officials said. Florence's maximum sustained winds have been clocked at 165km/h after it was downgraded to a Category 2 on the five-step Saffir-Simpson scale, according to the NHC. The winds had been as high as 225km/h earlier in the week when the storm had rated as a Category 4 major storm, but North Carolina Governor Roy Cooper warned against complacency because of the drop. "Hurricane Florence was uninvited but she's just about here anyway," he said at a news conference. "My message today: Don't relax. Don't get complacent. Stay on guard. This is a powerful storm that can kill. Today the threat becomes a reality." 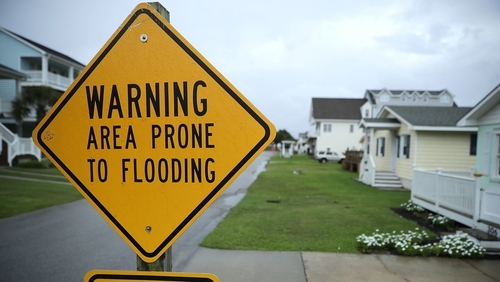 The storm's centre was about 230km east of Wilmington, North Carolina, at 11am local time but tropical storm-strength winds and heavy rains already were hitting North Carolina's Outer Banks barrier islands. Some 6,000 power outages had already been reported by 10am this morning. Florence could bring wind-driven storm surges of seawater as high as 13ft and NHC Director Ken Graham said they could push in as far as 3km. Heavy rains were forecast to extend into the Appalachian mountains, affecting parts of Alabama, Tennessee, Kentucky and West Virginia. After criticism for its response in Puerto Rico to last year's Hurricane Maria, which officials there said was responsible for 3,000 deaths, Mr Trump has vowed a vigorous response to Florence and defended his handling of Maria. "3000 people did not die in the two hurricanes that hit Puerto Rico," Mr Trump said on Twitter. "When I left the Island, AFTER the storm had hit, they had anywhere from 6 to 18 deaths... Then, a long time later, they started to report really large numbers, like 3000." Mr Trump provided no evidence to support his challenge. "There is still time to leave," Mr Cooper said. "This is an extremely dangerous situation." Brock Long, the head of the Federal Emergency Management Agency (FEMA) in charge of disaster response, has come under investigation over his use of government vehicles. He has said he is focused on Florence but that he had followed all statutes and laws and would co-operate with any investigation. Millions of people are expected to lose power and it could take weeks to resolve the outages. "It's going to be bad," said Woody White, a county commissioner. "But no matter how bad it's going to be, it will pass and our job will be to rebuild this community together."